Part of our new JLINE range! Two door plastic cupboard with 3 adjustable shelves (20kg load per shelf). Lockable with a padlock (padlock not included). This cupboard is "shower proof", so although it is water resistant, it is not 100% waterproof. This cupboard is best suited for use in a garage or shed. 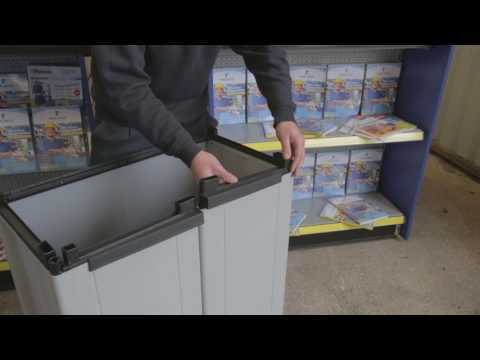 Ideal for sheds, garages, schools, offices or general storage. 20 minute assembly! Top quality, made in the EU. Water resistant (not waterproof). Extra shelves are available to purchase (subject to availability).